Have you ever met a nail polish so transformative, so intriguing, so unbelievably amazing, you simply can't get enough of it? Such is the case with Deborah Lippmann Happy Birthday for me. Every time I look at the bottle, I want to see how it will affect my current manicure. 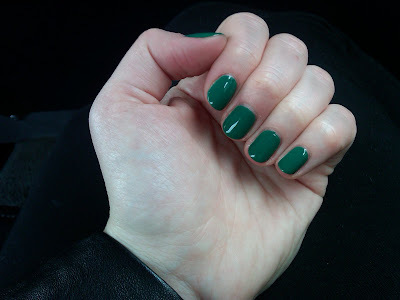 And since my OPI Jade is the New Black manicure had held up so well since last week -- seriously, not a single chip! -- I decided to keep it on and layer Happy Birthday on top. Keep reading to check out before and after photos! Deborah Lippmann Happy Birthday retails for $19 at beauty.com.